For over two years now, Elon Musk and his private space company (SpaceX) have been working towards the creation of a reusable rocket system. Known as the Falcon 9 Reusable Development Vehicle (F9R Dev) – or “Grasshopper” – this system may prove to be the greatest development in space travel since the invention of the multistage rocket. After multiple tests that reached greater and greater altitudes, the latest attempt at a takeoff and soft landing took place this past month. Timed to coincide with SpaceX’s launch to the International Space Station (which took place on Friday April, 18th) the landing was apparently a success. Several days after the launch, Elon Musk tweeted that the “[d]ata upload from tracking plane shows landing in Atlantic was good!” This update came on April 22nd, and as of yet, no definitive data of whether the first stage landed correctly, or whether it was still in one piece by the time the recovery boats got to it. Presumably SpaceX will provide another update in due course. In the meantime, they took the opportunity to release a rather awesome video of what the Falcon 9 Reusable should look like when successfully performing a vertical takeoff and vertical landing (VTVL). The video has accumulated an astonishing 3,598,143 views in the last two weeks, which is indicative of the level of interest this project and its impications have garnered over the past few years. Meanwhile, the resupply mission went off without a hitch. 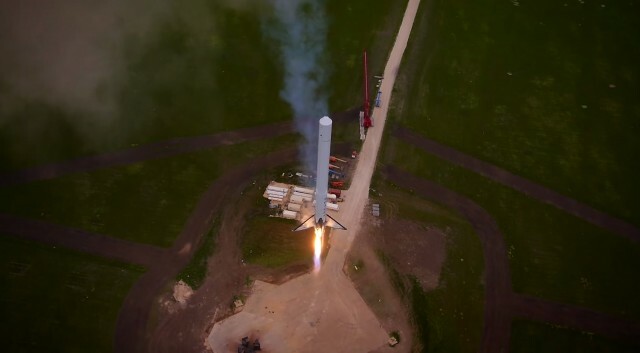 Officially designated as CRS-3, this mission was even more significant due to the fact that its Falcon 9 launch vehicle featured the same retractable landing legs and the ability to soft land as the Grasshopper test rocket. However, in the case of the ISS mission, it was the first time where a Falcon 9 was tested in a real-world scenario where the rocket would return to Earth after reaching Low Earth Orbit (LEO). Though the rocket was successfully picked up by the ISS, the jury is still out on whether or not the soft landing was a success or not. To minimize any risk, the first stage of the Falcon 9 attempted to “soft land” in the Atlantic. Unfortunately, according to Elon Musk, due to “13- to 20-foot waves… It’s unlikely that the rocket was able to splash down successfully.” Using telemetry data gathered from a SpaceX spotter plane, it appears that everything else went to plan, though. Because of the rough seas, though, the retrieval boats couldn’t make it to the landing site, and thus the rocket is unlikely to be recovered. In the meantime, SpaceX will spend the following days and weeks analyzing more detailed data from the launch, and then update the Falcon 9 design and launch protocol accordingly. However, it is clear at this point that these latest tests are not being considered a failure, or reason to cease in their efforts. I would consider it a success in the sense that we were able to control the boost stage to a zero roll rate, which is previously what has destroyed the stage — an uncontrolled roll… I think we’re really starting to connect the dots of what’s needed [to bring the rocket back to the launch site]. I think that we’ve got a decent chance of bringing a stage back this year, which would be wonderful.